Seed that was donated or bought in for the exchange. The time has come to get busy sorting and packeting seed for the American Primrose Society seed exchange which I have been the manager of for the past three years. The seed has been ordered from a number of good companies and donations have all arrived from very generous members who have taken the time to collect, clean, label and send their precious seed to me so it can be distributed to members of the society all over the world! During the short and cold days of winter I have lots of free time between the growing seasons to spend a few hours a week on this important and valuable task which is a great resource for folks to obtain seed of so many species of Primula that you can’t find anywhere else! 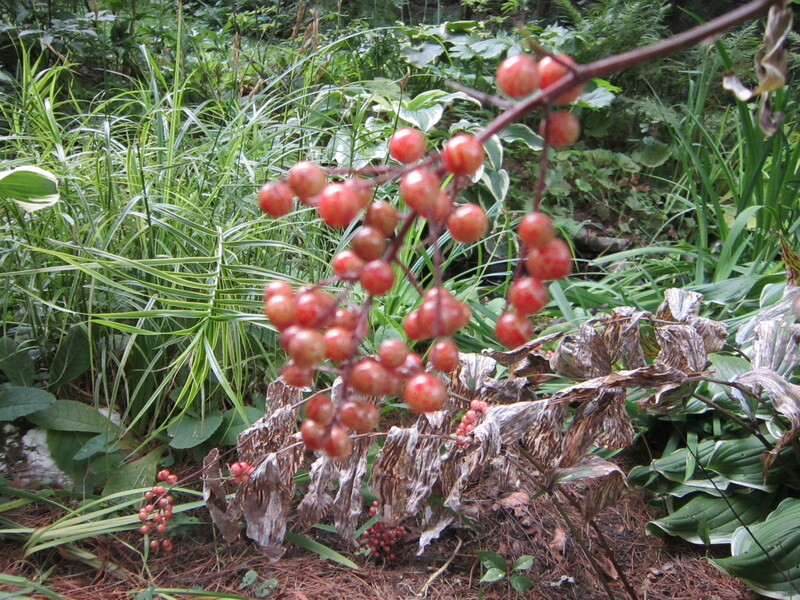 P. sieboldii comes in so many different forms and colors. P. polyanthus Gold Laced are very coveted plants that wins many ribbons at the shows when grown to exacting standards. P. polyanthus Garnet Cowichan grown from seed from Barnhaven Primroses of France with the best seed available and the APS seed exchange offers many of them! The rare and prized P. kisoana ‘Alba’ grows and spreads by stolons just under the soil surface and loves a nice moist and shady spot. Here it growing along the edge of the stream that runs through my property. P. kisoana the sister of the previous white form. This one spreads much faster and creates a lovely groundcover fairly quickly. There is seed of the Barnhaven Double Primroses on this years APS seed list which you will find here. Not every seed will become a double form but if any turn out as nice as this one it’s all worth it! Friend and fellow Primula nut, Arlene Perkins gave a piece of this plant to me a few years ago which she named ‘Agnes’ for a good friend of hers. And of course there will be seed for many different P. auricula! I grew this one a few years ago from APS seed and it has always performed well for me. Primula are really so easy from seed that more people should be growing them. There are many species that are very hardy and will survive winters up to at least US zone 4 without any protection! I will be testing that statement this winter as I never got around to covering my flats of seedlings and potted plants this fall. Right now they’re covered with a good layer of fresh snow, so I’m hoping that will stay around long enough to keep them well insulated against any deep freezes we are sure to get and have already gotten this fall! Trays and trays of plants and seed pots waiting for a good layer of snow because I was too lazy to give them a warm fleece blanket and layers of tarps. One of the coldframes full of P. auricula, cyclamen and other treasures. One of my propagation beds full of P. auricula, Hellebores, P. sieboldii and others. These will winter just fine without protection and have grown so well here in partial shade. Almost all Primula seed can be sown either in late fall or through the winter on top of moistened potting mix, covered with a thin layer of chicken grit and then placed outside to experience all the weather winter will throw at them with germination in the spring as the temps warm up. Easy as that! Only a few should be sown indoors and kept under lights or in a sunny window or if you’re lucky enough…a greenhouse. I sow so many seeds through the winter that I order through APS or NARGS that I am kept very busy during this ‘down time’ until the nursery opens in April. Spring is such a wonderful time for the gardener and seed sower…so much anticipation and expectation! Every morning is spent patrolling the gardens and nursery for signs of growth and when those first green shoots appear from something more unusual and exotic that was sown during the depths of winter, the feeling is fantastic! Here are a few parting photos of Primula just to get you to take a look at the APS seed list and start dreaming about all the possibilities! P.japonica seeds around and comes in so many different colors. P. auricula cross from Susan Schnare. August Can Be Pretty Too! I thought I would take you on a tour of the gardens to show you what is either blooming now or looking great and giving the gardens color at this time of the summer when it seems like the gardens are really winding down and not looking all that inspiring. Fruit & foliage can take on brighter colors and beter texture now as they mature so don’t forget those. 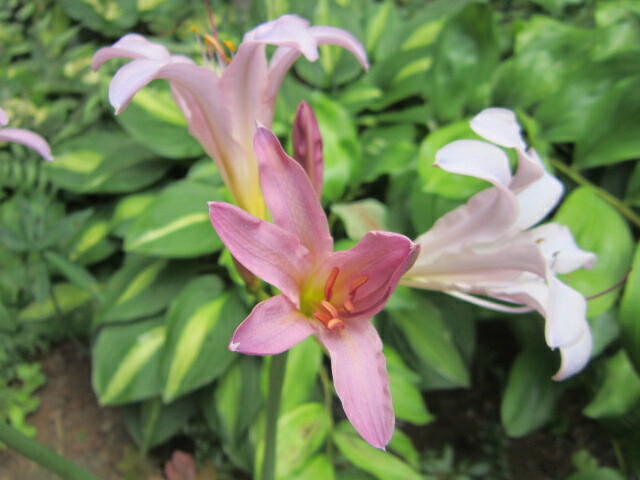 Lycoris squamigera or Nekkid Ladies is a hardy bulb to zone 5. It pops up seemingly out of nowhere and overnight! 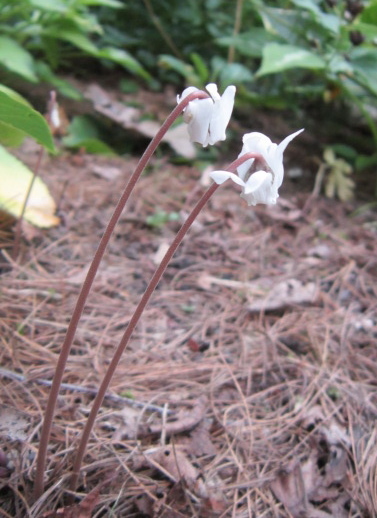 The long strap-like leaves emerge in the spring and die back by mid-summer. 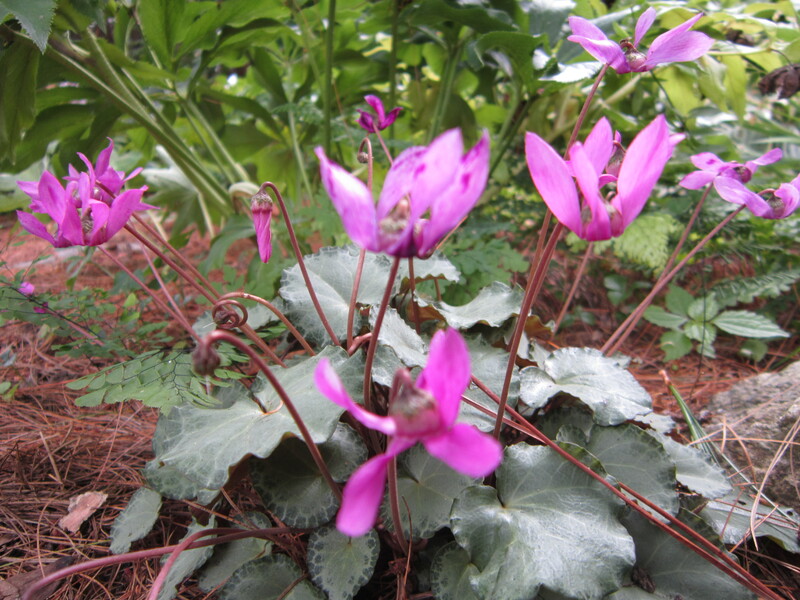 Cyclamen hederifolium flowers are just popping up now. This one I brought back from my trip last year to Portland Oregon and the Seattle area. The flowers are pure white and the leaves will emerge soon with the prettiest silver markings and they will last through the winter! Hopefully I will get some seed to collect next year. 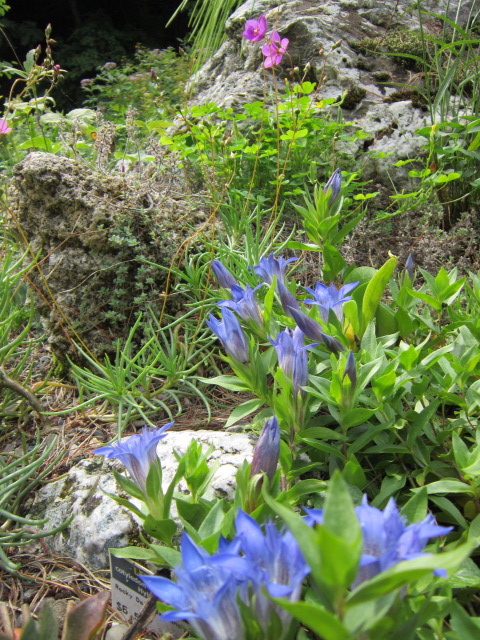 In the foreground is Gentiana septemfida, a fabulous late blooming Gentian and this is the best it has ever looked! 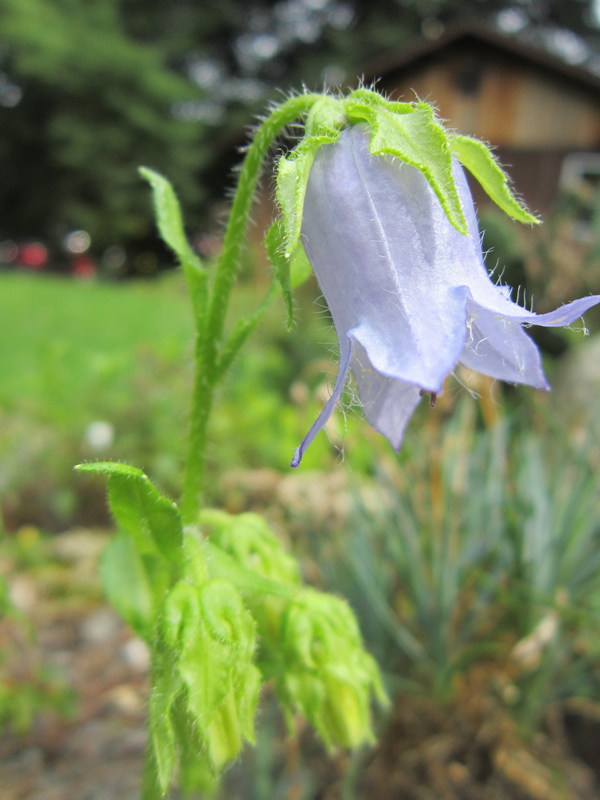 The rains of spring & summer have really helped bring on blooms to many plants this year. In the background is a Talinum calycinum and pretty succulent-like plant that seeds gently around and flowers for a long time. 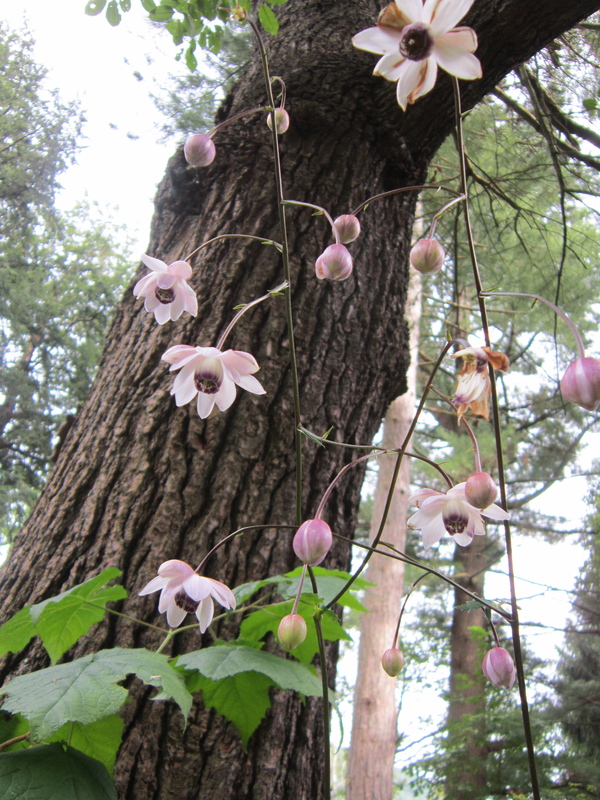 Anemonopsis macrophylla is one of the most beautiful late summer blooming perennials. The tall willowy stems hold blooms that are delicate looking but have lots of substance. They love good rich composty soil and I really should move them to a moister spot instead of under the large pine where the soil goes very dry. But they are doing well there and give me lots of seed every year. The garden doesn’t just have to be about flowers! Here are the beautiful berries of the native wildflower Smilacina racemosa or False Solomon’s Seal. This great plant is all over the woods here and these were growing in this garden when I started gardening here so I left them in place and cleared all the other weeds, brambles & nettles out around them. 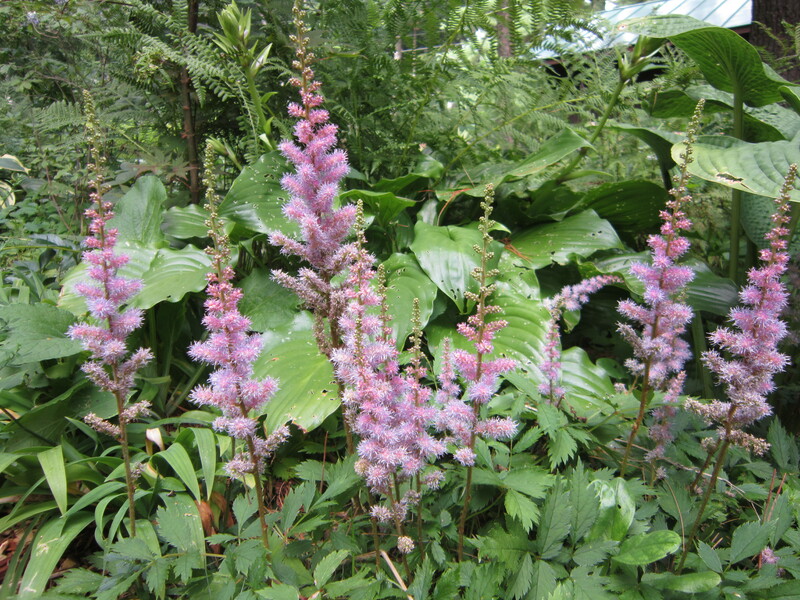 Here is my favorite Astilbe! A. chinensis ‘Pumila’, a small groundcover type that blooms so late in the season, well after all other Astilbes have given up. It spreads slowly and blends with so many other plants in the garden that I’ve divided it many times and have it all over for that welcome color so late. Most Aconitums are in bloom now or will be soon. 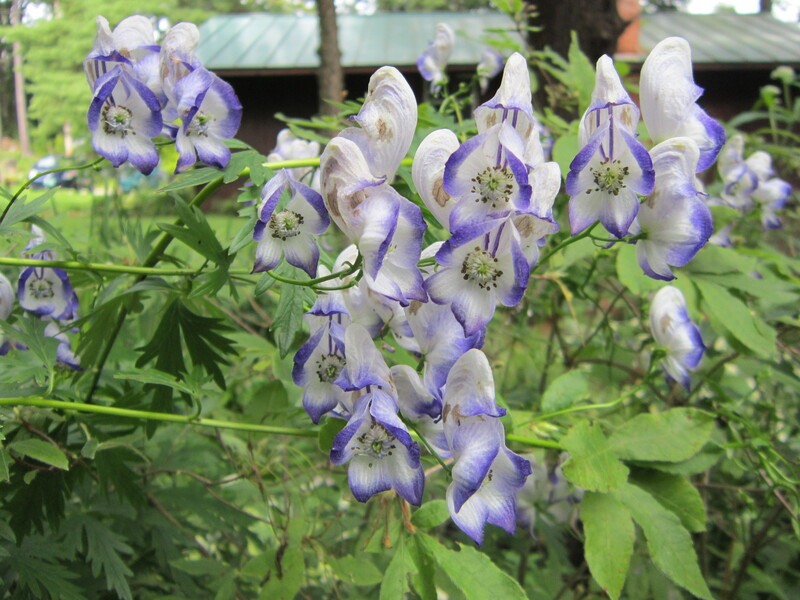 This Monkshood is A. X cammarum ‘Bicolor’. I moved it from a spot that was way too dry for it and now it’s doing so well! Aconitums are another perennial that is easy from seed. It just needs a bit of a winter chill for germination. 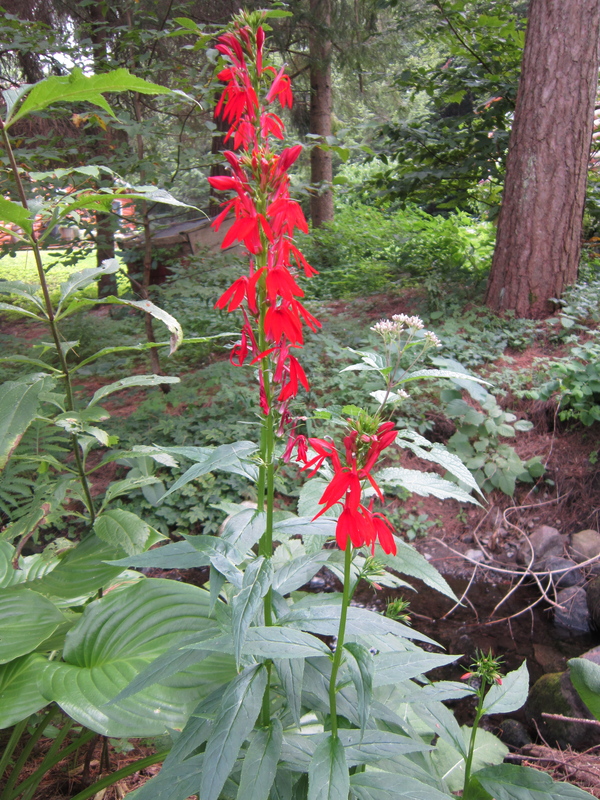 What is redder than Cardinal Flower?? Lobelia cardinalis has got to be the reddest flower out there! I have this one planted next to the stream so it gets plenty of moisture all summer and winters a little on the drier side which it likes. I have two more plants waiting in the wings for a spot along the stream. 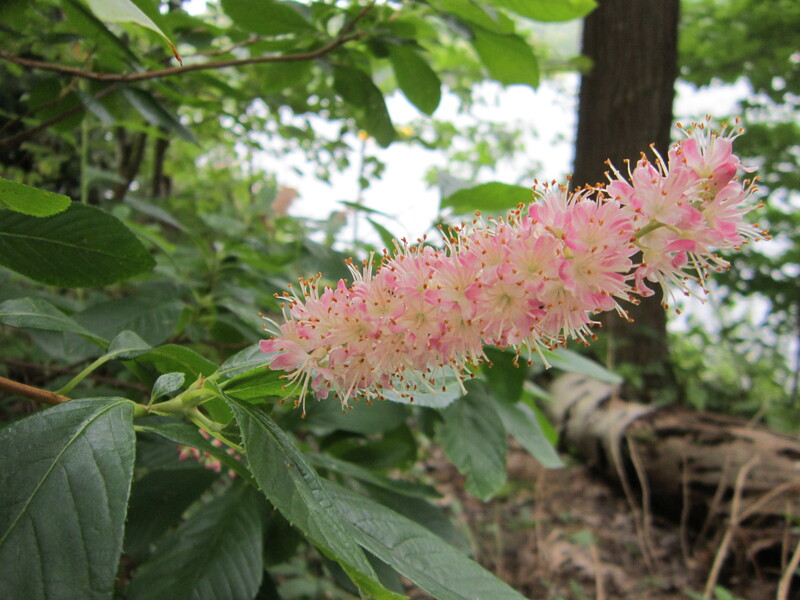 Native shrub Clethra alnifolia ‘Ruby Spice’ is a fragrant late blooming addition to the woodland garden. If it got a little more sun it would probably flower more heavily, but I enjoy what flowers it gives me. 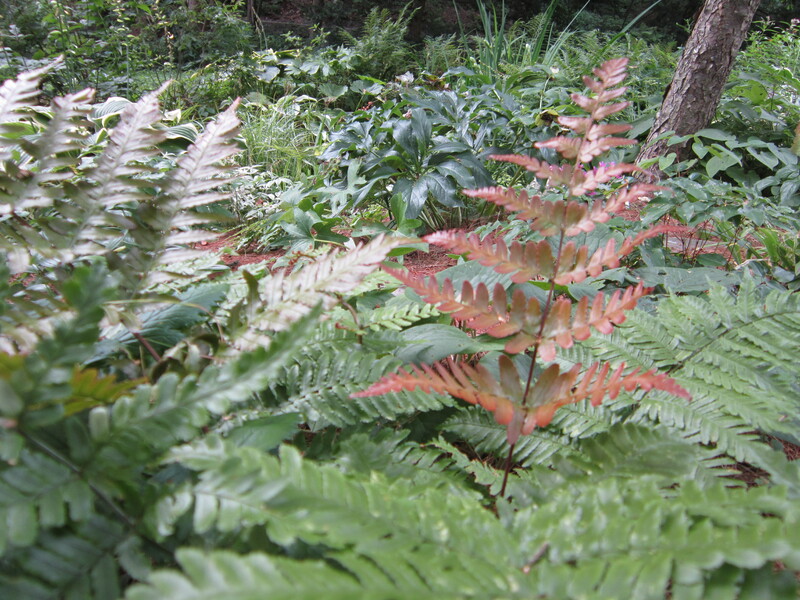 While most ferns are taking a back seat at this time of year, this fern Dryopteris erythrosora ‘Brilliance’ is still front and center with the bright orangey fronds and the shinyness of the entire plant. It is a beauty and not very well known yet. All summer it keeps sending out new fronds with this coloration that fades to all green after a few weeks. Well that’s what is still looking great in the gardens now. There are other things I haven’t shown like the Agastache foeniculum ‘Golden Jubilee’ that brightens up my small sunny border, or the many Hostas that dot the gardens and are in bloom now. But I hope this selection gives some ideas to what is still possible for the shady woodland garden to keep it colorful and pretty.